It’s looking awesome and IT IS NOT DIY – sigh . . . Count your blessings, my dear!!! You are so right, if it was DIY this would have a different ending. Ha. It is DIY design just not DIY construction. That is WAY more my speed. Thanks so much, I am very excited!!! That round thing is an air gap. It helps prevent dirty water and/or raw sewage from backing up into your dishwasher (from your sink). In some states/municipalities it is code and in other places it isn’t. Often they let you install a drain line “loop” which would prevent the same thing (and you don’t have that ugly thing on your counter) but that isn’t legal some places. It is usually mandatory if you have a garbage disposal vs. a regular old drain. 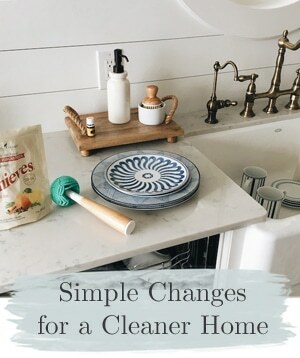 The other bonus is that if your dishwasher drain ever clogs, the dirty water will spit out of that little round thing and into your sink instead of leaking all over your floor! I just used that same color grout in my bathroom. It’s the perfect warm neutral. I agree! It”s a great color. Hi Melissa! How exciting! I’m loving the look so far. And I bet you are so happy to have your kitchen come this far. We are in the process of redoing our kitchen too. 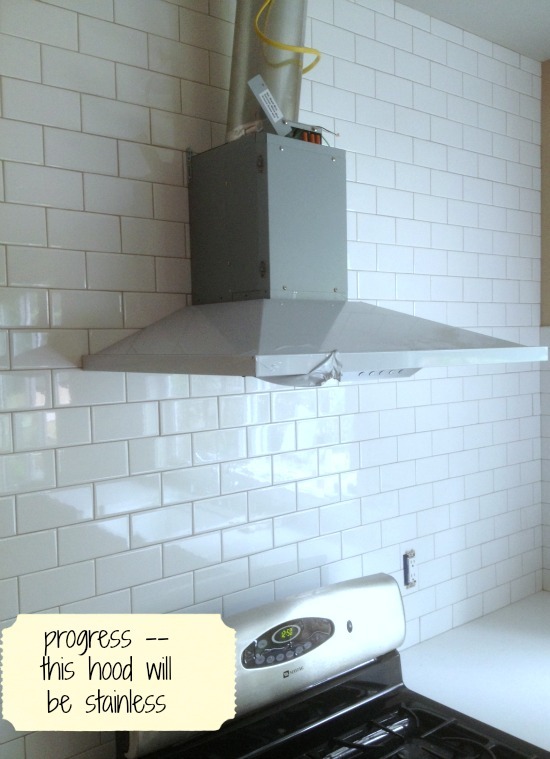 Painting walls, cabinets, the kitchen island…all of it. We cook so much for church functions our kitchen has had too much wear and tear to survive. So we are going for a new look too. I’m so happy to finally be doing something so I can relate to your happiness. I like everything you are doing. It looks wonderful. Thank you Debbie, can’t wait to see what you are up to!!! Melissa, Thank you for taking the time to share your kitchen remodel. It is very helpful to see how colors play out especially things like grout which can be difficult to choose. Once it’s done, it’s done so fingers are crossed that the color will work. You did great! Have a sweet day! Oh I can’t wait to see it all done. I’m so excited for you. Love the tile. Oh wow Melissa, you must be so excited. I’m so glad you did your tile to the ceiling! I love it!!! The more I see subway tile, the more I think I’ll be using them when I rip out my existing backsplash. Love them!! Your kitchen is turning out so beautiful! I see Kim let you know about the dishwasher air gap. One more important tip to note…always be sure the little holes in the cover are facing the sink! If your dishwasher ever gets clogged and cannot drain properly the water will drain from this line and hopefully into your sink. We had this issue a while back and the air gap cover was turned toward the counter and created quite a wet mess!! 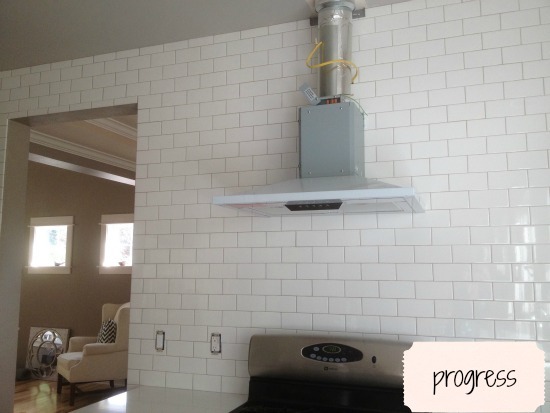 I am loving that subway tile wall…and love the oyster gray grout color too! You must be so excited. It’s going to look amazing. Great grout choice. The grey grout looks fantastic. Last month we had our hall tiled and used this colour grout as well. In our case, the tiles are black. The grey goes well with them. It’s surprising it goes well with lighter tiles too. Love the look of your kitchen! In a few years we will remodel our kitchen. 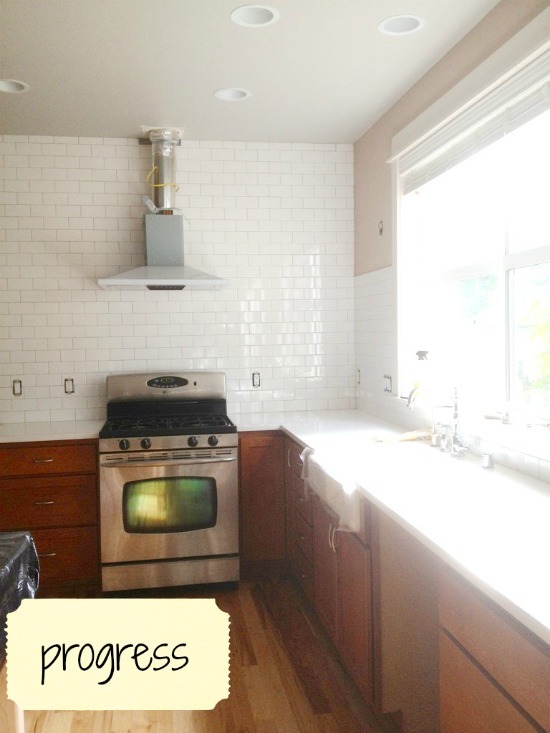 I definitely want subway tile backsplash and stainless appliances! I love it when the details start coming together, too!! Everything is coming together nicely!!! Oh, I’m pretty sure the air gap is required in Washington. I’d never seen one either until we moved here. You know how Washington loves regulations and codes, don’t you? I love that grout color. I used it with my white subway tiles in my kitchen remodel. Oh my — I love everything! Your sink is just beautiful, and I love your subway tile walls. Gorgeous! Can’t wait to hear more! Do you mind telling me where you purchased the subway tile and your grout? 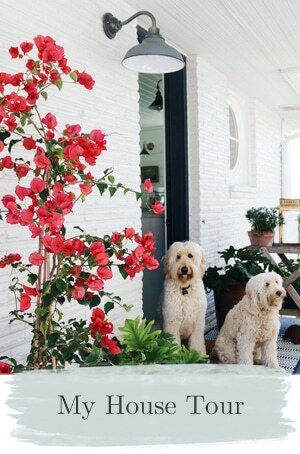 I love that look and that’s exactly what I have pictured for my upcoming kitchen reno. Thank you, and I LOVE your blog! Thank you!!! Both the tile and the grout came from Dahtile. The color of the tile is 0910. Happy remodel! Thank you SO much! Can’t wait to see your finished kitchen! 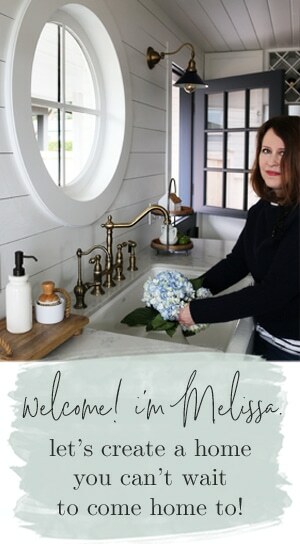 Hi Melissa! We start on our kitchen remodel tomorrow and the one thing I haven’t picked out yet is my white subway tile. I’m also planning to take it to the ceiling. 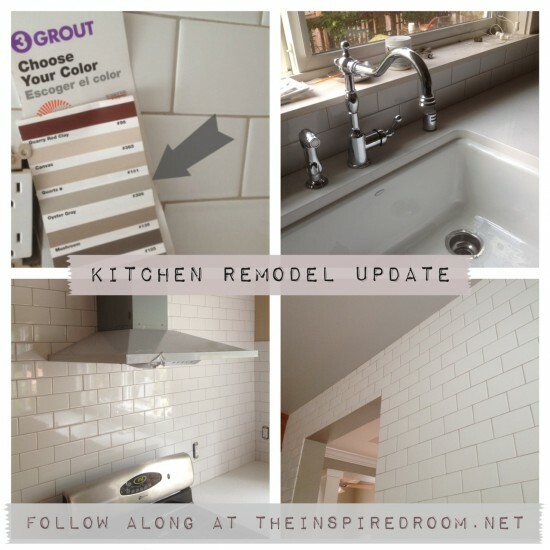 Loving your grout color (thanks for the tip) and wondering where you bought your tile. What shade of white did you go with and are they the standard 3×6? I’m in the PDX area and will be checking out Daltile and Pratt & Larson this week-end. 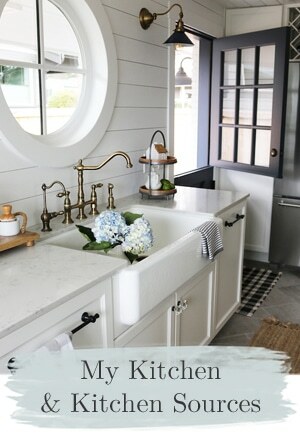 My cabinets will be painted a warm white (BM Mascarpone) with mix of wood and soapstone counters. Do you have a recommendation? Hi Amy!!! Both the tile and the grout came from Dahtile. The color of the subway tile is 0910. Have fun with the remodel! Can’t wait to see the finished kitchen. soon,I hope, I will be remodeling my kitchen. We are in desperate need of good new cabinets that close. Would like to pick out new countertops, backsplash, flooring, railing, and appliances. Be nice to have something “we” picked out and not what “they”-exwife and hubby- picked out! Love the grout color! What is the size of the grout line? I know you mentioned “tiny”. Just put the tiles as close together as you can, and then grout fills the space that’s left. I’m not sure of an exact width 1/8″ maybe. :-) Thanks! I love the subway tile! I’m sorry if I missed it somewhere but i’m wondering about the color of your subway tile too. there are so many whites out there! where did yours from? 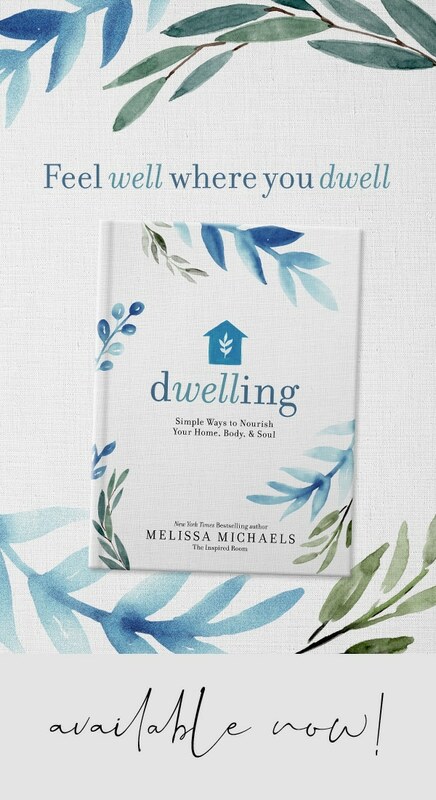 Thank you so much for always sharing the details of your home. We are getting ready to build our dream farmhouse, and the details are overwhelming. The options are endless! 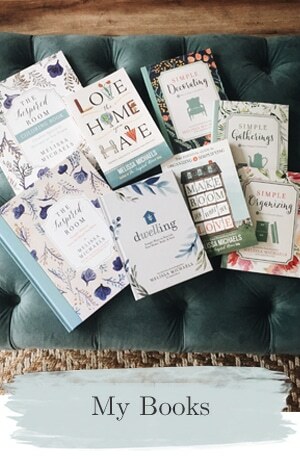 Your home is one of my favorite inspiration homes and your source list is one of my go-to places for help. Thank you! Hello, I have just installed subway tile in my kitchen with a gray grout. My question is this. Did your contractors caulk where the tile meets the counter tops. If so, what color did they use? Also where the tile meets a painted wall. Would you use a paintable grout to match the wall? I love the Oyster Gray color and am considering it for my kitchen but the majority of my house is Harvest Brown paint by Behr. 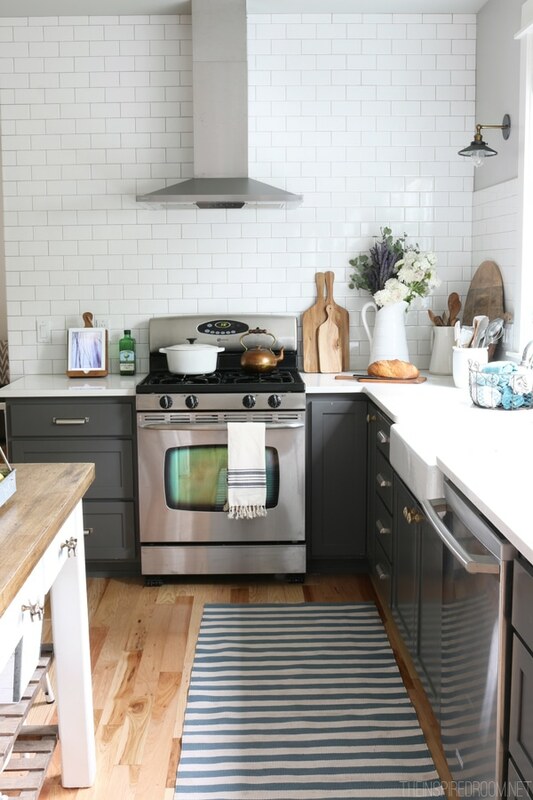 My counters are black with a bit of taupe in them and I am wondering if the Oyster Gray has enough brown color so that it does not clash with my walls…..
Hello! 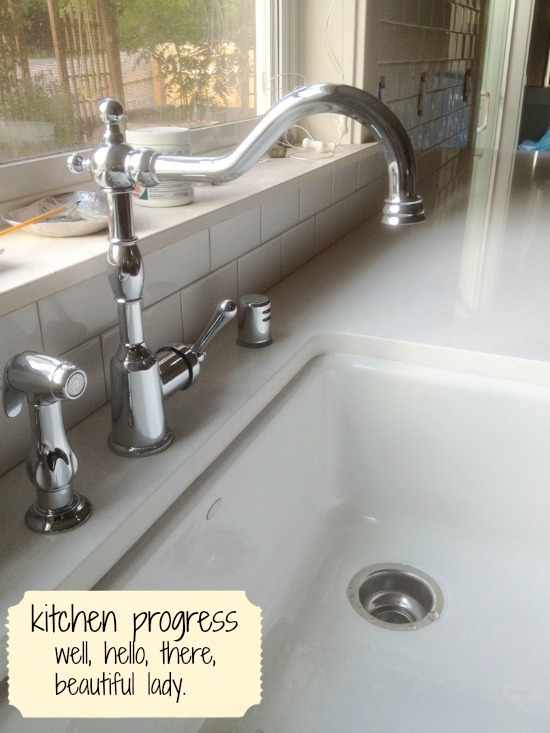 I am currently remodeling my kitchen as well, using your’s as an inspiration! Everything is going great so far. 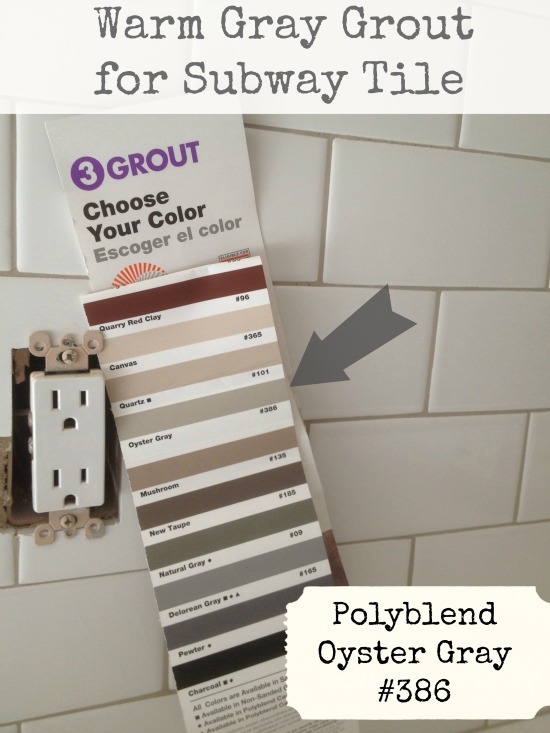 Question about the grout color: what made you choose oyster gray? My contractor is pushing for Delorean gray, saying that oyster gray will look like concrete. But I’m afraid the Delorean gray will be too dark and create too much contrast. Both my upper and lower cabinets will be Behr Flannel Gray.